"Nightline" takes a look at the tributes to the former president and the incredible relationships he had with his wife and family. 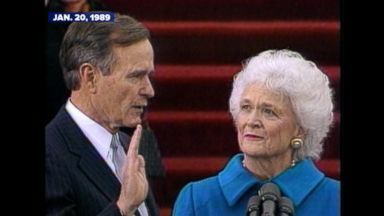 I, George Herbert walker bush, do solemnly swear -- You must feel a responsibility to others. You must believe in serving others. I think that's a fundamental tenet of my life. A life lived in service to our nation, from his days as one of the Navy's youngest fighter pilots in World War II to loyal vice-president at Ronald Reagan's side, he would then get his own chance as president, making friends across the aisle. His legacy now sealed as a man of great character. A man with a life well lived. Today, George Herbert walker bush, the 41st president of the United States, remembered fondly as he returned to Washington, D.C., for one final farewell. Canons fired off a 21-gun salute as hail to the chief played. Where eldest son, former president George W. Bush, stood at solemn attention with his hand on his heart, wife and first lady Laura bush by his side, the president's casket was placed on the Lincoln catapult in the rotunda where it will lie in state for public viewing until his funeral Wednesday. ??? ??? President trump and first lady Melania trump stopping by this evening to pay their respects. ??? ??? president bush, America's longest-living president, was flown from Houston to D.C. On air force one, via special air mission 41, his trusty service dog sully followed him along his journey, waiting for the president on the tarmac. After lying by his side at a funeral home in Houston. Every living president is expected to attend the funeral. Among them, president Clinton, who forged an unlikely close bond with his predecessor, one that included fishing trips and philanthropy. President Clinton sat down with ABC news to reed a portion of the letter left for him by 41 when he took office. He said, I wish you great happiness here. There will be tough times made even more difficult by criticism. But just don't let the critics discourage you or push you off course. How did you feel when you received that letter? I thought it was George Bush. I thought he meant it, but I also thought he was trying to be a citizen in the highest sense of the word. It was profoundly moving to me personally. 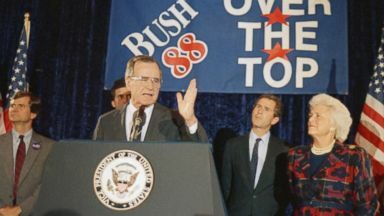 The death of president bush marks the end of an era in Washington politics. Over the years, bush discussed with ABC news his deep devotion to country and family. I've been very blessed. When you look around compared to life to others, how lucky we've been. President bush's legacy as a human will be one of great decency and devotion to country and family. So much a part of his legacy, a love story 73 years strong, the longest marriage in presidential history. President bush and former first lady Barbara Bush. They met at a Christmas dance in greenwich, Connecticut. My grandmother was wearing her red and green Christmas dress. I said, who is this good looking girl, that beautiful girl over there? The rest is history. Barbara Bush set eyes on 17-year-old George Bush, and never looked back. Is he still the handsomest man you've ever seen? Yes. My eyesight is getting bad. Golly. Will you describe Barbara Bush for me? Careful. Inside or out? Anyway you want. Inside. A kind and strong and loving person, whose priorities are family, her garden, her faith. I like the picture. Would you describe George Bush for us? Well, I'd like to say ditto. Very funny, George is. Very warm, very wise, very caring. I would put faith as a very important part of George's life, and family, and friends. He's good. My grandfather was with my grandmother while she was sick, during her last days. And then on the day that she passed away, he was there all day holding her hand. ??? ??? At her funeral in April, president bush was next to her casket greeting mourners who would come to pay their respects. It absolutely amazed me. There he sat for hours shaking hands, because he knew that they wanted to see him. So, it was one last act of duty. After my grandmother passed, my grandfather was back in the hospital the day after. There is breaking news. Former president George H.W. Bush has now been hospitalized with an infection that has spread to his blood. I just remember talking with my mom and my family members and just saying, we just need to get him to Maine, because that's really where his heart is. And that is where he went, to his beloved home in kennebunk port, Maine. I just feel relaxed here by the coast. He spent his last summer there, surrounded by family, in October attending the wedding of his granddaughter, Barbara Bush. Family means everything to me. 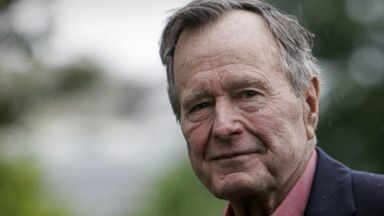 With five surviving children, 17 grandchildren, eight great grandchildren, bush was a true family man to his last breath. 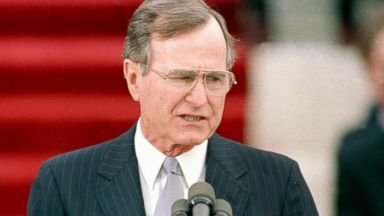 His final words, "I love you, too," spoken to his son George W. Bush on the telephone before he passed away quietly at home in Houston. He will be laid to rest at his presidential library in college Station, Texas, next to his wife and daughter robin. Heaven. And I don't fear it. When I was a little guy, I'd fear death. I'd worried about it. I'd be scared. Trump said that Bush "led a long, successful and beautiful life" and "his accomplishments were great from beginning to end."